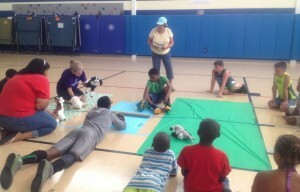 Featured on MyEasternShoreMD.com: Character Counts coach Marie Simpkins teaches the Horizons summer campers a lesson on “How to Settle Your Differences Peacefully.” Simpkins wrote a play and used puppets to engage the students in the lesson. Once a week throughout Horizons’ six-week program at Radcliffe Creek School, Character Counts coaches taught character lessons to the campers.” (Learning that character counts, August 27, 2014). Click here to view all news stories.